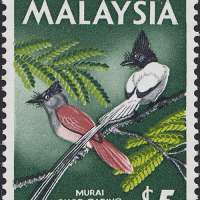 Small parties of these birds are not uncommon in dry lowland jungle and on well drained slopes in the hills throughout Malaysia. They feed on the ground, rarely flying for more than short distances. 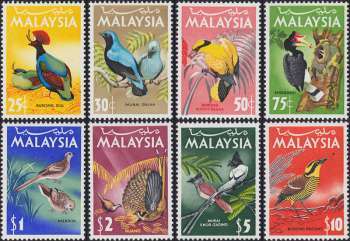 The call is a low melodious whistle, which rings through the trees, and gives rise to the common Malay name. Nest is a thick bed of dry leaves, eggs white, averaging 1.45 by 1.20 ins. 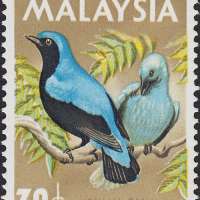 A common and showy bird of the tree-tops in lowland and hills forest throughout Malaysia, where the brilliant blue of the male in flight, is a memorable sight. The normal call is a melodious double whistle - "wit-wiu". Not gregarious, but usually associated in pairs, whose movement is largely influenced by the seasonal fruiting of the trees on which they feed. Nests are of untidy cup made of twigs, placed high up in trees. 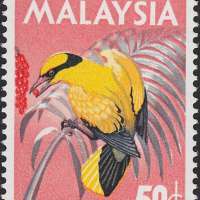 Essentially a bird of the towns and gardens of Western Malaysia, never seen in our native forests, and absent from the Borneo States. Usually seen in the canopies of trees, where they feed on fruit, rarely descending to the ground. Flight is strong and direct, usually at tree-top level. The familiar call, frequently uttered, is a beautiful whistle - "ta-kee-you" (sometimes omitting the first syllable). The nest is commonly slung in a fork, far out on a slender branch sixty or seventy feet up in a tall tree, in park-land or orchard. It is composed of bark, twiglets, grass and roots. The colour of the egg is white, tinged with violet, sparsely spotted and blotched with purple-brown - measuring 1.27 by 0.8 ins. This magnificent bird is restricted to the tall forest of our lowlands and foothills , and because of its specialized habits is unfortunately severely threatened by expanding rural development. Where it survives it can be seen feeding on the fruits of tall trees, its normal diet. The call rather goose-like, honk. is often uttered antiphonally by a pair of birds in flight. Normally associated in pairs or small family groups, occasionally forming small flocks. 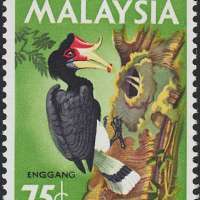 As among all hornbills, the female remains in the nest hole, the entrance to which is partially closed by a plaster of mud, during the process of incubation and for some considerable time after the eggs have hatched, being fed by the male. To his home land he will fly away." 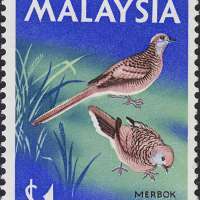 A common bird of open country and villages, and a favourite pet of Malaysians. Regular contests are held when the singing powers of caged birds are matched, and large side-bets may be placed. In the wild, these doves feed mostly on the ground. Nests are small and flimsy platforms of stick built in trees. Eggs white, measuring 0.9 by 0.65 ins. 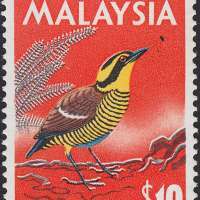 An inhabitant of tall forest, preferring the well drained slopes of the foothills, throughout Malaysia. Shy and seldom seen, but usually betrayed by its powerful call, either a double - "wak-wau", or a long series of plaintive single notes, each rising imperceptibly in tone. The males maintain so-called "dancing-ground", small clearings which are kept scrupulously clean and free from debris, to which they repair to call and display. 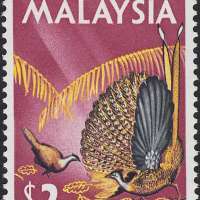 This habit renders the Argus Pheasant vulnerable to poachers, and already over much of Malaysia, this unique and beautiful bird has disappeared from its ancient haunts. This beautiful bird is found in the forest of lowlands and foothills throughout the country. In flight the long tail-streamers of the male flutter like a length of still ribbon. Nests usually are placed about six feet from the ground in a fork of a slender sapling. They are deep cups of moss, lined with dead grass or fibre. The eggs are glossy, the ground colour is faintly pink, sparsely spotted with reddish-brown and blotched with salmon-pink, measuring about 0.8 by 0.6 ins. Pittas are shy birds of the forest floor and undergrowth, disappearing with a flash of brilliant colour at the least sign of danger. 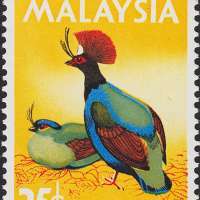 The Banded Pitta is not uncommon locally in the drier lowland jungle of the north. It appears to prefer the vicinity of limestone hills (probably because of the profusions of small snails on which it feeds).